How do I join a "drop-in" support group? Do I have to preregister? Who attends the support group? How many attend? Generally about 6 - 14 people attend the group, ranging in age from teens to adults. The group tends to grow larger in February and October and smaller in the summer and around holiday season. How do I know if the support group is meeting this week? The support group runs every week – but there are occasions when the leaders need to cancel. 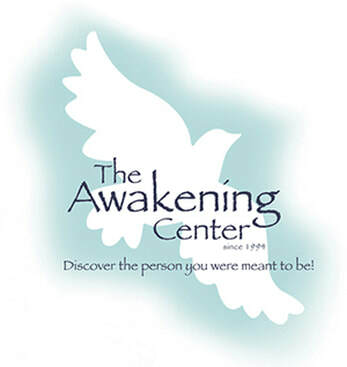 Please "Like" us on The Awakening Center Support Group Facebook page. We try to keep the page updated when the support group has to be cancelled. What eating disorder do most of the members have? Many members are recovering from bulimia; others are divided between those recovering from overeating or anorexia. Even though the members' body sizes or behaviors may be different from your own, we have consistently found that the underlying issues are the same for all. "I don't feel like I am 'recovering' at all. Is the group for me?" Or "I no longer engage in the eating disorder behaviors. Is the group for me?" The group is open to members in any stage of recovery. Some members are in the very beginning stages of recovery, some are farther along in that they have an understanding of their symptoms and issues. Some members are fully recovered and continue attending for support to reinforce their recovery. The group usually begins with a reading and then the rules/ guidelines are reviewed. We then do a check in and "agenda items" (issues that might be talked about) are given. At the end of the group we have a check-out and a can is passed for donations. The suggested contribution is $5. The group usually ends with another reading. What do you talk about in the meetings? The focus of the support group is recovery; an important rule in the group is that specific foods, numbers or behaviors may not be spoken of directly. Some common themes that we do talk about are: frustration, anxiety, trust, relationships with friends and family, and coping skills. Is there a fee? How much does the group cost? Our suggested donation is $5.00/week, but you may give more or less according to your own income and expenses. Do I have to be in individual or group therapy to be in the support group? No, anyone who has any problem with eating, food, weight, exercise, etc. can attend the support group. You do not have to be in therapy to attend the support group. If I attend the support group, do I still need to go to individual or group therapy? Isn't being in the support group enough? While a support group can be therapeutic it is not a therapy group nor is it meant to be a substitute for individual or group therapy. It is meant to provide support to you while you work on your personal issues in individual or group therapy. We believe that while it is possible to recover without individual or group therapy, it would be very difficult to do so. What is the difference between the support group and a therapy group? There are several differences. In a support group, whoever shows up at any particular meeting, whether it is 3 people or 13 people, that is the membership of the support group for that meeting. New members are allowed to join any week and members can stop attending whenever they want. While a core group, members who attend on a regular basis may form, there is no guarantee of continuity of members. In a therapy group the number of members is fixed and there is a prescreening process to determine if the person is appropriate for the group. New members are only allowed to join when a member leaves the group. Because the same members attend on a weekly basis, a therapy group can build a level of trust and intimacy that is not found in a support group. This trust and intimacy is necessary to take the risks necessary to produce growth within the group setting. Can family members or significant others attend the groups? Yes. We welcome anyone who is a support to you in your recovery; we simply ask that family members abide by the group guidelines that are shared at the beginning of each meeting.